Negotiates the best software and implementation partner pricing based on our extensive experience. ISM’s proven software selection methodology is widely considered the gold standard for the industry. Our ability to help secure the best software pricing for our customers is unrivaled. ISM’s Implementation Roadmaps are built on our time-tested “Top-Down/ Bottom-Up” methodology that blends management vision with operational priorities to deliver outstanding results. Leveraging our philosophy that successful customer-centric strategies involve 50% People…30% Process…20% Technology, all Implementation Roadmaps include people, process and technology “streams” to ensure enthusiastic user adoption, operational efficiency and an enhanced customer experience. Hundreds of customers for more than 3 decades have counted on our Implementation Roadmaps to drive the success of their customer-centric initiatives. 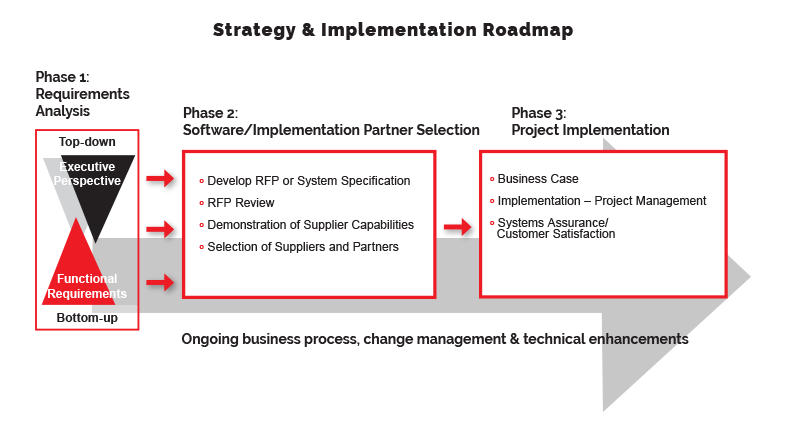 Our Software Selection & Implementation Plans typically take 3-4 weeks to complete. For additional information about ISM’s Software Selection & Implementation Roadmap, call (301) 656-8448, or e-mail us at sales@ismguide.com.